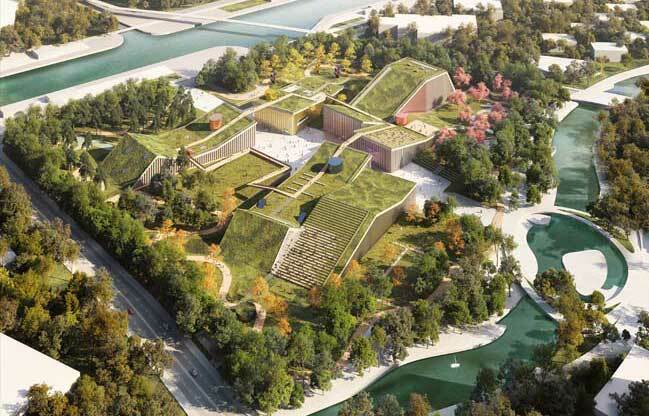 MVRDV has won the competition for Zhangjiang Future Park - a 100,000sqm park and culture centre in Shanghai. Project's description: Zhangjiang Hi-Tech Park is located in the Pudong district of Shanghai, China. It was established in 1992 as a site for business enterprises, R&D companies and educational institutions who operate within the world of high-technology and innovation. Over time many national and international companies have chosen to settle there and today there are approximately 4000 companies and over 100,000 workers in the area. Besides being a business and industrial park, it is also a residential neighbourhood for the workers’ families. The Zhangjiang community is therefore mostly constituted by highly educated people who work and study in the area. The goal of this project is to provide the community with public facilities that are lacking in the area: a social centre where people can meet, gather, talk, learn, play and enjoy each other’s company in a high-quality and beautiful setting. 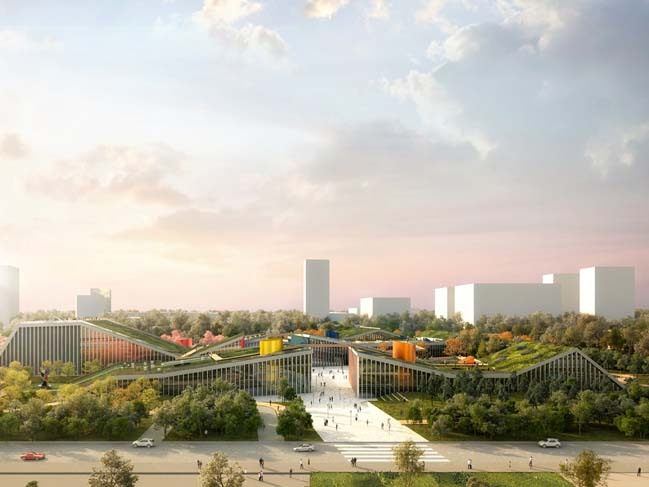 The MVRDV project for Future Park aims at inserting a new urban complex that on the one hand expresses Zhangjiang’s current character and on the other hand expresses its future ambitions. Future Park will be located on an island, at the crossroads of valuable green areas and water bodies. The concept stems from a combination of nature, culture and entertainment to provide the area not just with services, but with a recognizable destination. A smart combination of these two aspects is at the core of the proposal. High-quality public space and leisure activities are integrated into a park setting. The proposal combines the relaxation coming from a natural setting with the intense excitement of a city centre. The project consists of a vertical layering of the two conditions. Park lawns and urban plazas are set at two different levels and have very different and recognizable characters. They are strongly connected by multiple paths that allow visitors to easily move from one to the other. Together they form a new hybrid morphology which responds flexibly to the needs of the Zhangjiang community at any time of the week. The building volumes gently blend into the landscape and provide the park with activities. Multiple access points converge towards the main central square, providing each a different perception of the site. 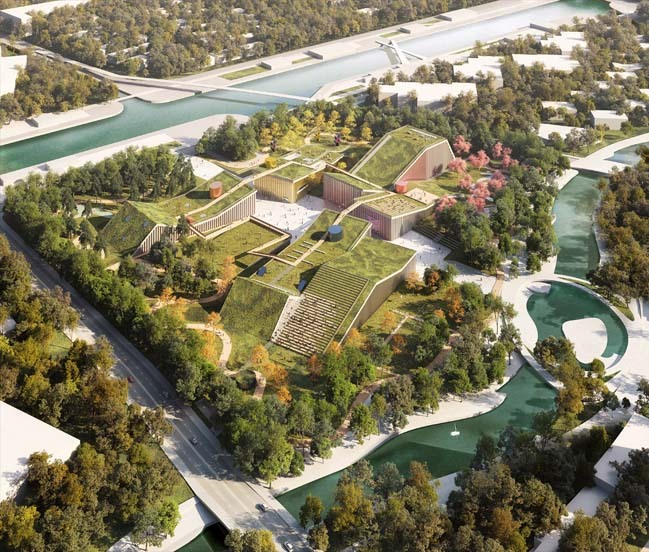 The design proposal forms an intriguing silhouette, a recognizable collection of buildings that emerge from the park: a crack in the landscape that produces urban life. People are able to walk not just around the buildings, but even on top of them, therefore experiencing radically different perspectives of the site. The green roofs programme is as lively and diverse as the park programme and strongly integrated with the buildings’ functions. 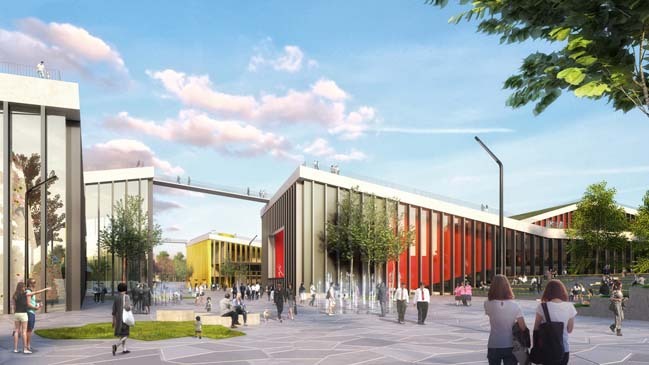 The complex is formed by four large public buildings, a library, an art centre, a performance centre and a sports centre. Together they offer an outstanding array of cultural and entertaining services within a very short walking distance in between them. The library will exhibit its books through the glass facades and invite users through a large atrium. The atrium will effectively work as an extension of the plaza, offering a space for sociality and reading. On the upper terraced floors, users will be able to concentrate more as both noise and light will be attenuated by contained and smaller spaces. A total surface of 10000sqm will offer specific sections for children literature, comics, magazines and a multimedia collection. The art centre will provide space for temporary exhibitions and a small collection of paintings and sculptures. The whole 5,000m2 will overlook the central space: an atrium that connects the entrance hall to all levels and rooms. Users will be guided by stairs, escalators and tribunes to visit and enjoy every floor, surrounded by art and natural light. 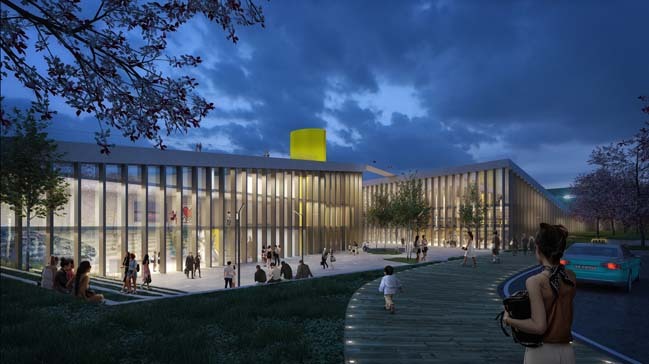 The performance centre invites users through a common atrium to both theatres: the large theatre will seat 700 people and will be able to host large productions of plays and concerts, while the small theatre will seat 300 people and will be used for children shows and minor events. A total surface of 10,000m2will offer spaces for music, lectures, dining and relaxing. The sports centre offers two main activity areas, one related to water sports and the other to ball games. A common entrance leads to both, the olympionic swimming pool and the multifunctional sports hall. The 10,000m2 of sports facilities will be exposed to the landscape and the natural light, making an indoor match feel like an outdoor event. The project has the ambition and the potential to become one of the new public social catalyzers not just for the district of Zhangjiang, but for the entire city of Shanghai.